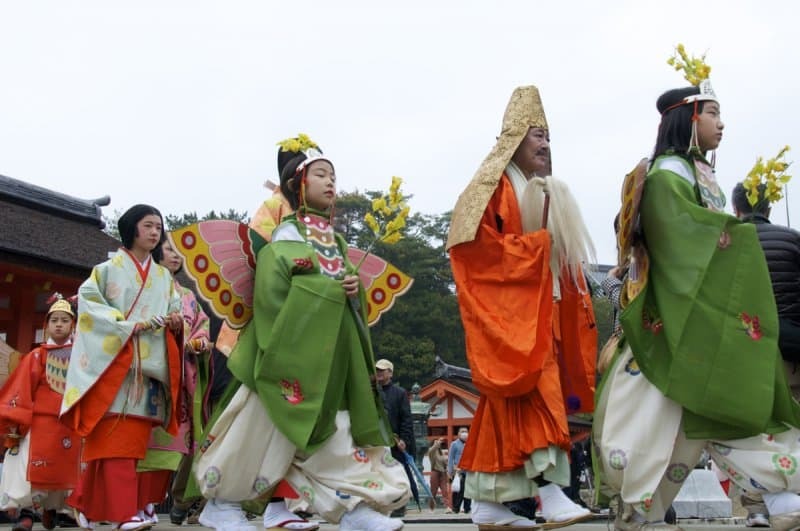 Every year in March, a Heian costume parade is held on Miyajima to give thanks to Taira no Kiyomori who developed Itsukushima Shrine during the 12th century, laying the foundations for the prosperity of the sacred island. Taira no Kiyomori was the medieval head of the Heike clan which dominated Japan in the second half of the 12th century. The Heike Monogatari (Tale of the Heike), which tells the story of the clan’s rise and eventual defeat at the hands of the Genji clan. 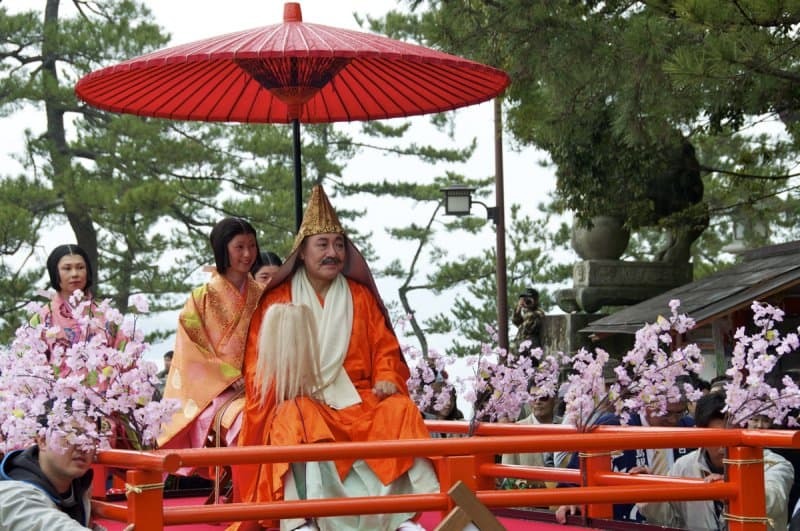 In this epic tale Kiyomori is portrayed as something of a villain, and despite attempts by historians to rehabilitate him, the unfavorable reputation has stuck. In and around Hiroshima, however, he is a much loved figure as Kiyomori was responsible for the development of Itsukushima Shrine on the sacred island of Miyajima, and for its beautiful and unique design that can still be seen today. 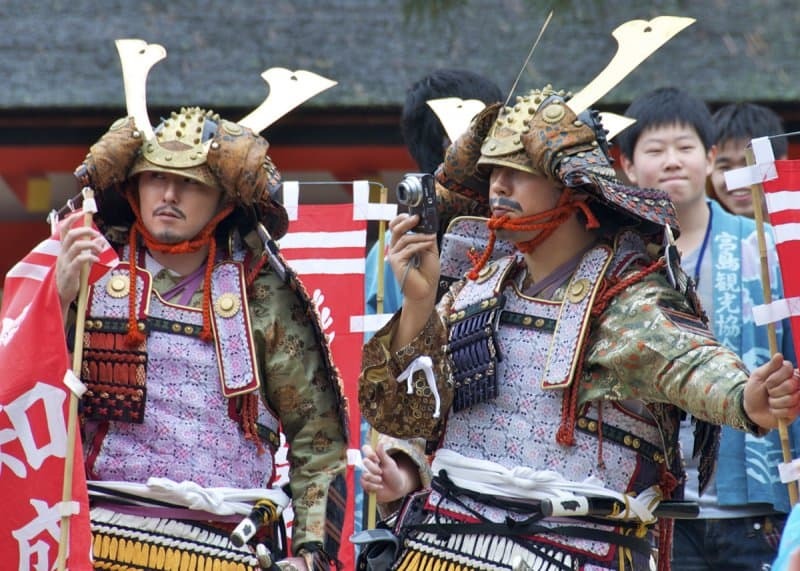 Every March, just as the weather is getting warmer and the cherry trees are starting to bud, the people of Miyajima pay homage to the medieval clan leader who put their island on the path to becoming a major pilgrimage and tourist site. Hoping to catch the opening ceremony I alighted from the ferry on with a couple of small kids in tow at around noon as a light rain started to fall. 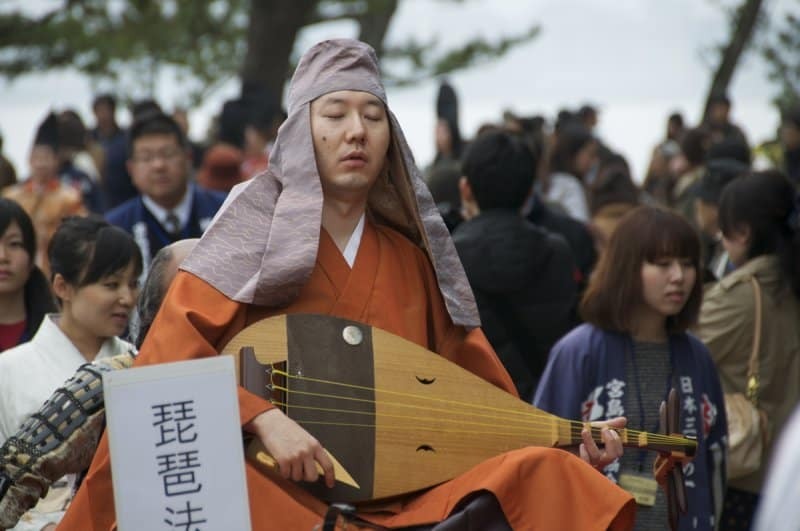 According to the Miyajima Tourist Office website, the event was to start off with a traditional biwa lute performance. It may well have done so, but there were so many people stood on the concourse next to the port that we couldn’t see anything other than a sea of umbrellas. Worried that the outing might turn out to be a total bust, we abandoned the main concourse and made our way down what would be the parade route hoping to find a spot where we could get a good look at the Heian period costumes. Figuring it best to avoid the narrow Omotesando shopping street, which is crowded at the best of times, we hoped to grab a spot above Mikasa beach where the path widens. From here there are great views of the floating O-torii Gate and Itsukushima Shrine itself. 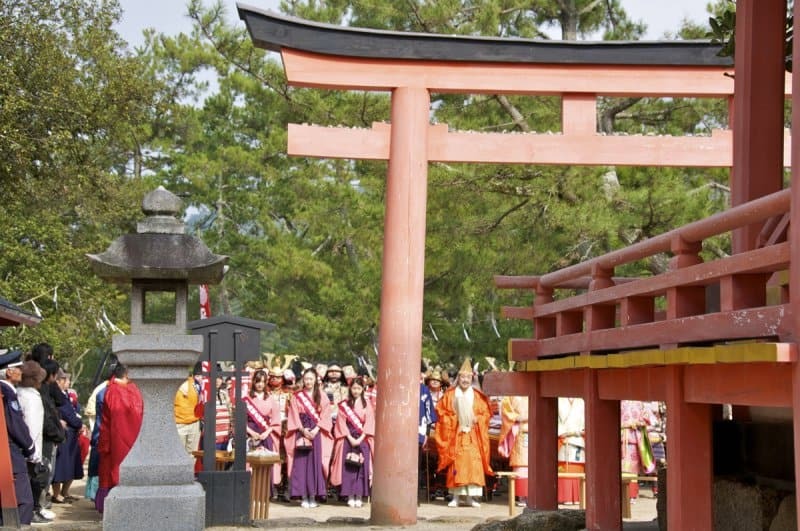 The best view of the parade would be of the participants passing by with the O-torii Gate as a backdrop. However, amateur photographers were already tightly packed along the stone wall – and it was obvious that they had arrived early to secure their spots. We opted to take a space at the base of one of the grand stone lanterns that line the seawall, and the kids amused themselves sketching pictures of the torii gate in their notebooks. 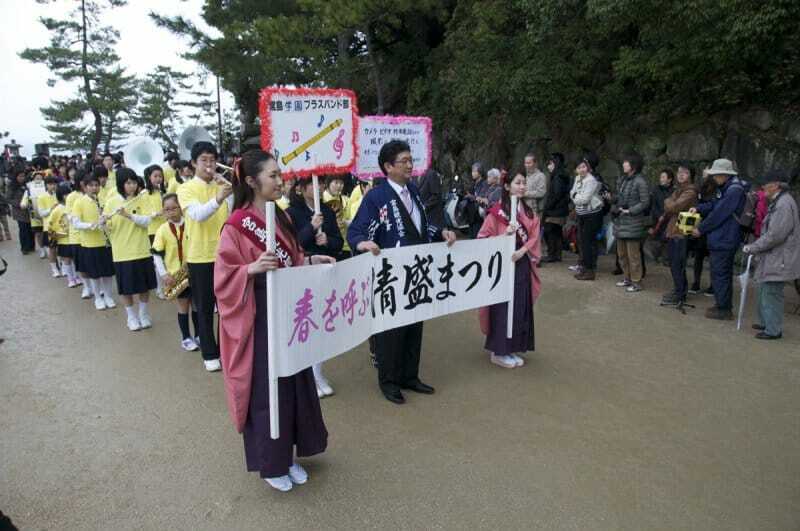 Soon, we heard the sound of the local school’s brass band which now approached, led by members of the local tourist association holding a banner. Groups of very cute small children in colorful dress and make up followed. 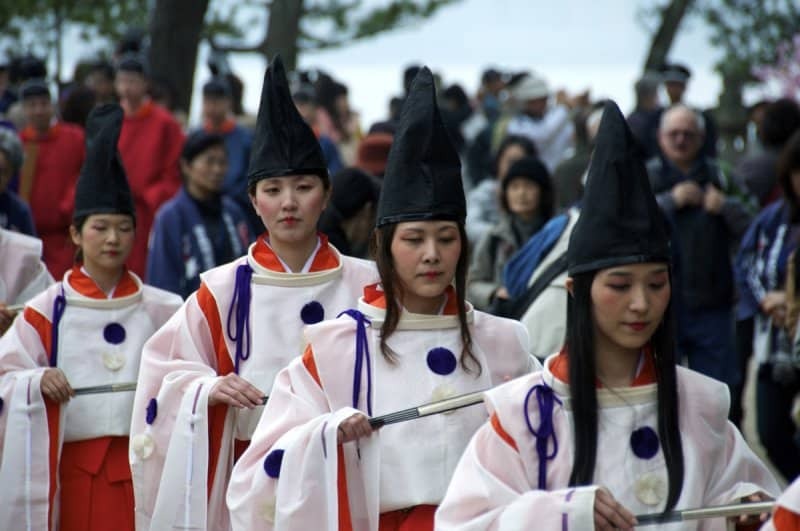 Then came women dressed as court ladies and shrine maidens, leading members of the Heike clan in samurai armor carrying banners emblazoned with the family’s intricate butterfly crest, a blind Biwa Hōshi (itinerant “lute priests” who spread the tale of the Heike throughout the land), before the man himself, Taira no Kiyomori, arrived atop an open float decorated with plastic cherry blossoms. 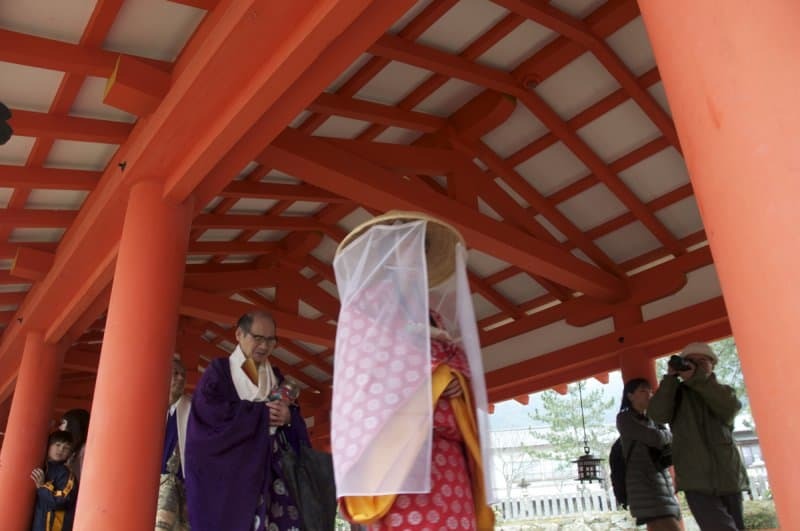 After passing us by, the parade made its way through Itsukushima Shrine itself. 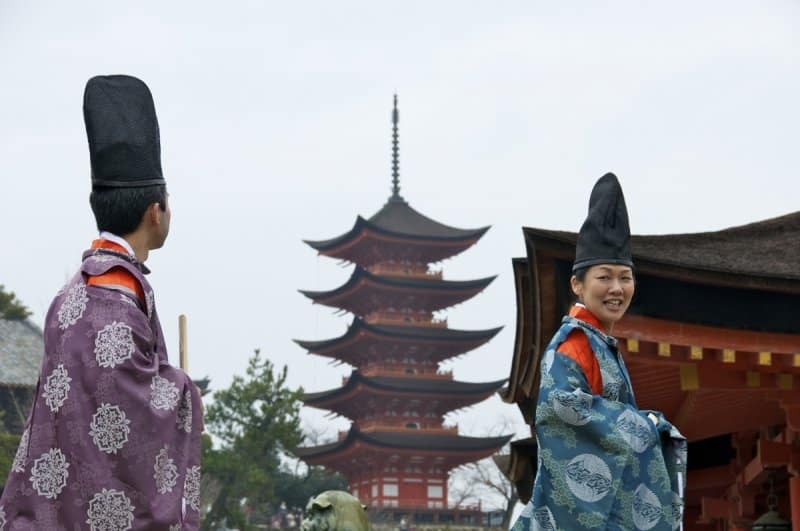 The procession is often described in local tourist literature as a living representation of a Heian scroll. 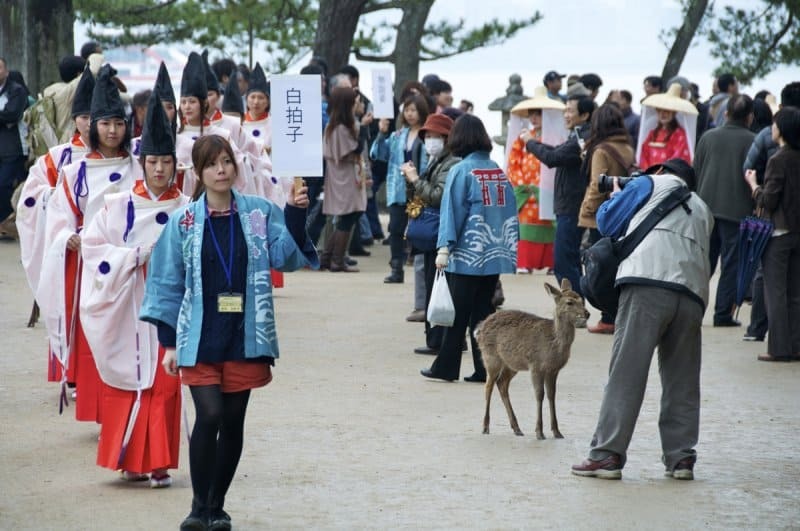 I can see what they mean, but the effect is greatly diminished by the crowds of family, friends and onlookers who mingle among the people in the parade and the fact that Itsukushima Shrine is open to the public while the parade passes through. Nonetheless, it does make for quite an impressive site. 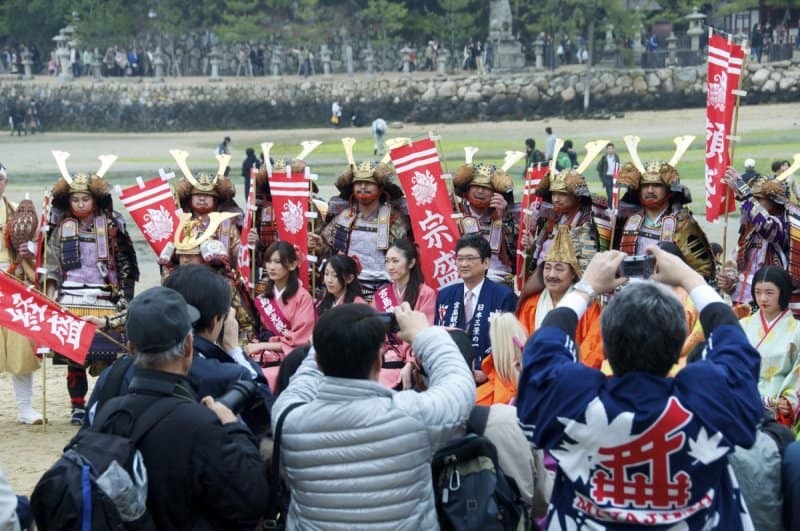 Once the parade has passed through the shrine the various groups pose for photos before making a final procession along the Nishi-no-matsubara sandbar to the Kiyomori Shrine where participants pay their respects and a simple Shinto service is conducted. After a couple of hours of taking photos, this was the perfect place to leave the parade as the excellent Kiyomori Chaya teahouse is just a few meters from the shrine.